Railpictures.ca - Ryan Gaynor Photo: Déjà vu: Road-worn, but still earning their keep, a pair of ‘Zebra Stripe’ GP38-2Ws guide train L540 through Guelph, ON in a scene that likely hasn’t played out since CN last operated on this line in the 1990s. Up until CN’s takeover of the Guelph Subdivision on November 16th, 2018, this line was operated by the Goderich-Exeter Railway. | Railpictures.ca – Canadian Railway Photography – photographie ferroviaire Canadienne. Caption: Déjà vu: Road-worn, but still earning their keep, a pair of 'Zebra Stripe' GP38-2Ws guide train L540 through Guelph, ON in a scene that likely hasn't played out since CN last operated on this line in the 1990s. 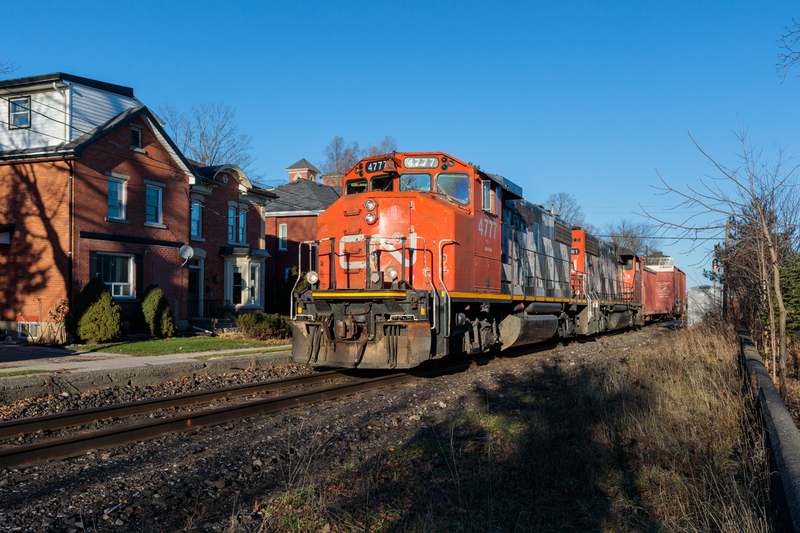 Up until CN's takeover of the Guelph Subdivision on November 16th, 2018, this line was operated by the Goderich-Exeter Railway. Only difference between present day and the CN Guelph Sub pre-GEXR is that these GP38’s were rarely seen around here. Wonder if they’ll ever get around to applying a fresh coat of paint to them.